After an injury to senior guard LaKeisha Eaddy, BJ Williams entered the starting lineup as the point guard for the women’s basketball team. Despite missing about half of her freshman year, sophomore guard BJ Williams has flourished in her second year on the women’s basketball team. TTN File photo Sophomore guard BJ Williams goes up for a layup against St. Bonaventure. Her play has exceeded coach Cardoza’s expectations. Things were going well for Williams during last year’s winter break. The 5-foot-7-inch point guard from Gwynn Oak, Md., had found a spot in the starting lineup despite being in high school mere months before. Then, while playing Duke in Durham, N.C., Williams broke her foot and missed the next 16 games. 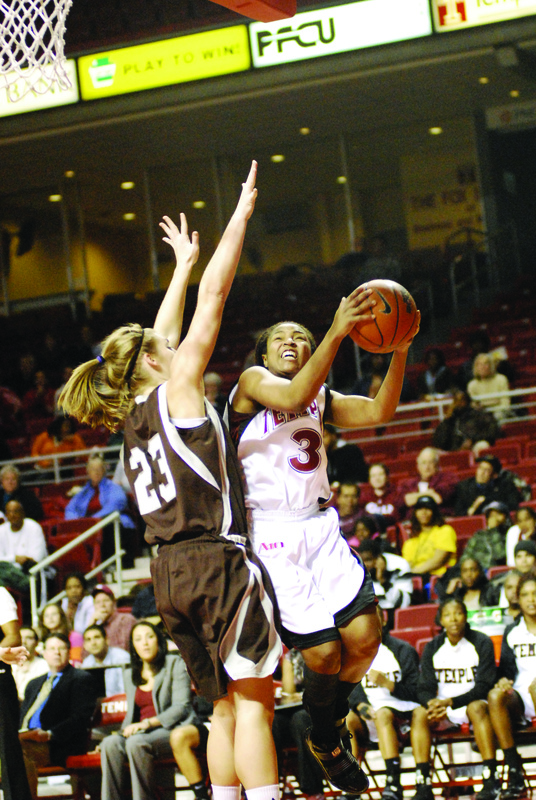 When she did return, Williams could not find her way back into the starting lineup for the season’s final two games. The Owls lost both contests, once to Charlotte in the Atlantic Ten Conference Tournament and once to Florida in the first round of the NCAA Tournament. The way the season ended helped motivate Williams to work even harder during the summer. Even though Williams improved significantly during the summer by both her and her coach’s standards, she started the season coming off the bench while junior guard Shaqwedia Wallace started in her place. Williams received a spot start against Kent State back in December and did not disappoint. She scored a career-high 23 points on 10-for-18 shooting. When senior guard LaKeisha Eaddy went down with a broken nose, Williams started for two games in her place. When Eaddy returned, Williams remained in the starting lineup with Wallace coming off the bench. On the year, Williams averages 7.1 points and 3.2 assists per game while playing 26 minutes a contest. During her freshman campaign, Williams only averaged three points and two assists per game in just less than 20 minutes a game. Williams herself fell victim to the injury bug and has been forced to sit out the last three games. She missed the first two with a sprained calf before twisting her ankle after practice last week, which caused her to miss last Saturday’s 79-68 victory against Charlotte. The injuries could prove beneficial. Sitting on the bench has forced Williams to see the game from a different perspective. Prior to her injuries, Williams was leading the conference with 5.1 assists per game. When Williams is on the court, she opens up the game for other players. Williams’ role is to make things happen for her teammates. Her uncanny ability to see the floor is something that sets her apart from other players, Cardoza said.